Ammonia is one of the most highly produced inorganic chemicals. There are numerous large-scale ammonia production plants worldwide, producing a total of 144 million tonnes of nitrogen (equivalent to 175 million tonnes of ammonia) in 2016. China produced 31.9% of the worldwide production, followed by Russia with 8.7%, India with 7.5%, and the United States with 7.1%. 80% or more of the ammonia produced is used for fertilizing agricultural crops. Ammonia is also used for the production of plastics, fibers, explosives, nitric acid (via the Ostwald process) and intermediates for dyes and pharmaceuticals. Before the start of World War I, most ammonia was obtained by the dry distillation of nitrogenous vegetable and animal products; by the reduction of nitrous acid and nitrites with hydrogen; and also by the decomposition of ammonium salts by alkaline hydroxides or by quicklime, the salt most generally used being the chloride (sal-ammoniac). Today, most ammonia is produced on a large scale by the Haber process with capacities of up to 3,300 tonnes per day. In this process, N2 and H2 gases are allowed to react at pressures of 200 bar. A typical modern ammonia-producing plant first converts natural gas (i.e., methane) or LPG (liquefied petroleum gases such as propane and butane) or petroleum naphtha into gaseous hydrogen. The method for producing hydrogen from hydrocarbons is known as steam reforming. The hydrogen is then combined with nitrogen to produce ammonia via the Haber-Bosch process. Due to the nature of the (typically multi-promoted magnetite) catalyst used in the ammonia synthesis reaction, only very low levels of oxygen-containing (especially CO, CO2 and H2O) compounds can be tolerated in the synthesis (hydrogen and nitrogen mixture) gas. Relatively pure nitrogen can be obtained by Air separation, but additional oxygen removal may be required. Because of relatively low single pass conversion rates (typically less than 20%), a large recycle stream is required. This can lead to the accumulation of inerts in the loop gas. The steam reforming, shift conversion, carbon dioxide removal and methanation steps each operate at absolute pressures of about 25 to 35 bar, and the ammonia synthesis loop operates at absolute pressures ranging from 60 to 180 bar depending upon which proprietary design is used. There are many engineering and construction companies that offer proprietary designs for ammonia synthesis plants. Haldor Topsoe of Denmark, Thyssenkrupp Industrial Solutions GmbH of Germany, Ammonia Casale of Switzerland and Kellogg Brown & Root of the United States are among the most experienced companies in that field. Ammonia production depends on plentiful supplies of energy, predominantly natural gas. Due to ammonia's critical role in intensive agriculture and other processes, sustainable production is desirable. This is possible by using renewable energy to generate hydrogen by electrolysis of water. This would be straightforward in a hydrogen economy by diverting some hydrogen production from fuel to feedstock use. For example, in 2002, Iceland produced 2,000 tons of hydrogen gas by electrolysis, using excess electricity production from its hydroelectric plants, primarily for the production of ammonia for fertilizer. The Vemork hydroelectric plant in Norway used its surplus electricity output to generate renewable ammonia from 1911 to 1971, requiring 15 MWh/Ton of nitric acid. The same reaction is carried out by lightning, providing a natural source for converting atmospheric nitrogen to soluble nitrates. In practice, natural gas will remain the major source of hydrogen for ammonia production as long as it is cheapest. As an alternative to the relatively inefficient electrolysis, hydrogen can be generated from organic wastes (such as biomass or food-industry waste), using catalytic (thermal) reforming. This releases hydrogen from carbonaceous substances at only 10-20% of energy used by electrolysis and may lead to hydrogen being produced from municipal wastes at below zero cost (allowing for the tipping fees and efficient catalytic reforming, such as cold-plasma). Catalytic reforming is possible in small, distributed (even mobile) plants, to take advantage of stranded biomass/biowastes or natural gas deposits. Conversion of such wastes into ammonia solves the problem of hydrogen storage, as hydrogen can be released economically from ammonia on-demand, without the need for high-pressure or cryogenic storage. In 2018, a test was successfully performed by CSIRO, filling two different manufacturers' fuel cell vehicles, with hydrogen extracted directly from ammonia. It is also easier to store ammonia on board vehicles than it is to store hydrogen, as ammonia is liquid at a much higher temperature, is more easily contained due to the larger molecule size, and is less combustible in the event of leakage. Waste water is often high in ammonia. Because discharging ammonia laden water into the environment, even in wastewater treatment plants, can cause problems, nitrification is often necessary to remove the ammonia. This may be a potentially sustainable source of ammonia in the future because of its abundance and the need to remove it from the water anyway. Alternatively, ammonia from waste water is sent into an ammonia electrolyzer (ammonia electrolysis) operating with renewable energy sources (Solar PV and Wind turbine) to produce hydrogen and clean treated water. Ammonia electrolysis may require much less thermodynamic energy than water electrolysis (only 0.06 V in alkaline media). Another option for recovering ammonia from waste water is to use the mechanics of the ammonia-water thermal absorption cycle. Using this option, ammonia can be recovered either as a liquid or as ammonium hydroxide. The advantage of the former is that it is much easier to handle and transport, whereas the latter also has a commercial value when a concentration of 30 percent ammonium hydroxide in solution is produced. One of the main industrial byproducts of ammonia production is CO2. In 2018, high oil prices resulted in an extended summer shutdown of European ammonia factories causing a commercial CO2 shortage, thus limiting production of carbonated drinks such as beer and fizzy soft drinks. ^ Twygg, Martyn V. (1989). Catalyst Handbook (2nd ed.). Oxford University Press. ISBN 978-1-874545-36-1. ^ "Iceland launches energy revolution". BBC News. 2001-12-24. Archived from the original on 7 April 2008. Retrieved 2008-03-23. ^ Bradley, David (2004-02-06). "A Great Potential: The Great Lakes as a Regional Renewable Energy Source" (PDF). Archived from the original (PDF) on 29 October 2008. Retrieved 2008-10-04. ^ Karl Fisher; William E. Newton (2002). G. J. Leigh (ed.). Nitrogen fixation at the millennium. Elsevier. pp. 2–3. ISBN 978-0-444-50965-9. ^ Huang, Jianyin; Kankanamge, Nadeeka Rathnayake; Chow, Christopher; Welsh, David T.; Li, Tianling; Teasdale, Peter R. (January 2018). "Removing ammonium from water and wastewater using cost-effective adsorbents: A review". Journal of Environmental Sciences. 63: 174–197. doi:10.1016/j.jes.2017.09.009. ^ Muthuvel, Madhivanan; Botte, Gerardine G (2009). "Trends in Ammonia Electrolysis". Modern Aspects of Electrochemistry, No. 45. Modern Aspects of Electrochemistry. 45. pp. 207–245. doi:10.1007/978-1-4419-0655-7_4. ISBN 978-1-4419-0654-0. ^ Gwak, Jieun; Choun, Myounghoon; Lee, Jaeyoung (February 2016). "Alkaline Ammonia Electrolysis on Electrodeposited Platinum for Controllable Hydrogen Production". ChemSusChem. 9 (4): 403–408. doi:10.1002/cssc.201501046. PMID 26530809. ^ Lin, P.; Wang, R.Z. ; Xia, Z.Z. ; Ma, Q. (June 2011). "Ammonia–water absorption cycle: a prospective way to transport low-grade heat energy over long distance". International Journal of Low-Carbon Technologies. 6 (2): 125–133. doi:10.1093/ijlct/ctq053. ^ Shokati, Naser; Khanahmadzadeh, Salah (August 2018). "The effect of different combinations of ammonia-water Rankine and absorption refrigeration cycles on the exergoeconomic performance of the cogeneration cycle". Applied Thermal Engineering. 141: 1141–1160. doi:10.1016/j.applthermaleng.2018.06.052. ^ "This is exactly why we're running out of CO2 for beer and meat production". iNews. 2018-06-28. 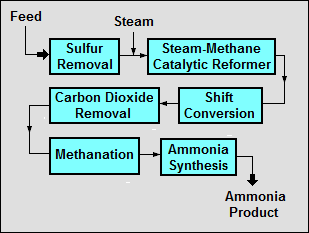 Ammonia: The Next Step includes a detailed process flow diagram. Ammonia production process plant flow sheet in brief with three controls.